I just played my first game of Mordheim! Travis, the proprietor of the superb video blog Hot Dice Miniatures, invited me to his lair to film a battle for this classic fantasy skirmish game. 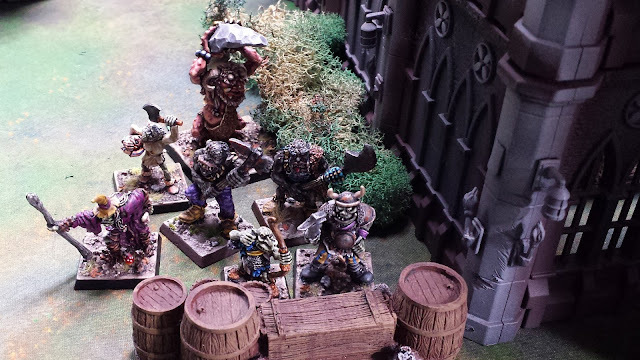 Travis just posted the action-packed video of my orcs clashing with his Marienburgers, and I hope you enjoy the spectacle of two lads with high spirits and higher blood\alcohol levels going at each other hammer-and-tongs. 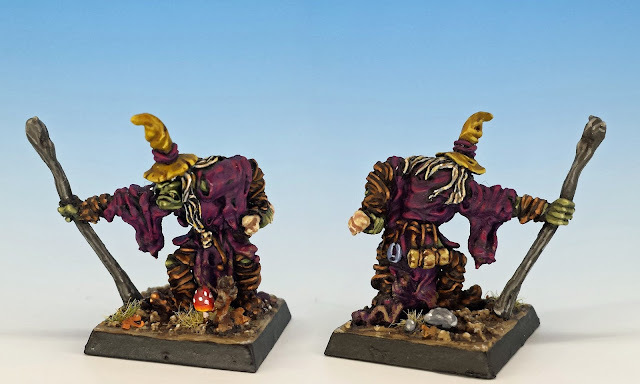 But I warn you, it's not a happy story... for that day in Mordheim was the Day the Vomit Died. My orc warband derives from my 3rd edition Warhammer Fantasy Battle army, Krapfang's Backwood Bandits. Loyal readers may recall General Krapfang's adventures, including The Bridge over the River Sty and the Battle of Cold Crumpet Farm. Clearly, Krapfang has fallen on hard times, since he has gone from commanding an army of greenskins to leading a small gang of Mordheim thugs. I figure he was the victim of a mutiny -- not altogether surprising, given the fact that he was never a capable general or a brave warrior. 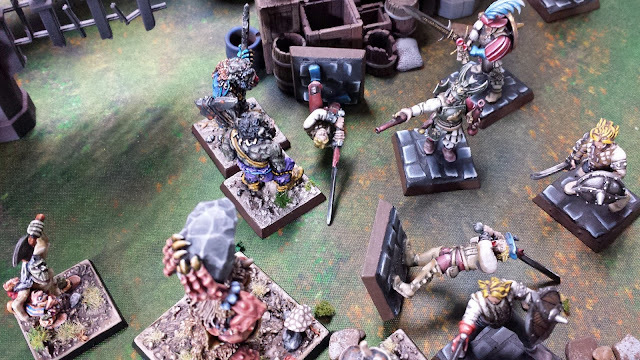 After his ejection, what would be left to do but assemble a threadbare rump of loyal followers and bring them to the ruins of Mordheim, hoping to make a fortune gathering wyrdstone? 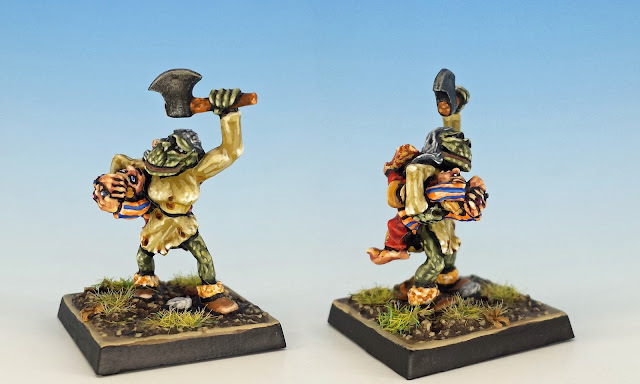 I've never designed a Mordheim warband before, but once I realized that the orcs could hire a Troll, everything fell into place. Krapfang's "cunning plans" always revolve around finding a big, hungry monster and then hiding behind it until the enemy is safely ensconced in its digestive tract. I rounded things out with a shaman, two elite warriors and some paltry missile support (in the form of Smarmy the Gobbo). Unfortunately for Krapfang, I had just enough points left over to include Ragwort Toothshyte. She is Krapfang's long-abandoned wife, and she's fastened to him like a hungry leech now that he lacks a phalanx of troops to keep her away. We played on Travis' fabulous table (pictured above) representing the ruined outskirts of Mordheim. 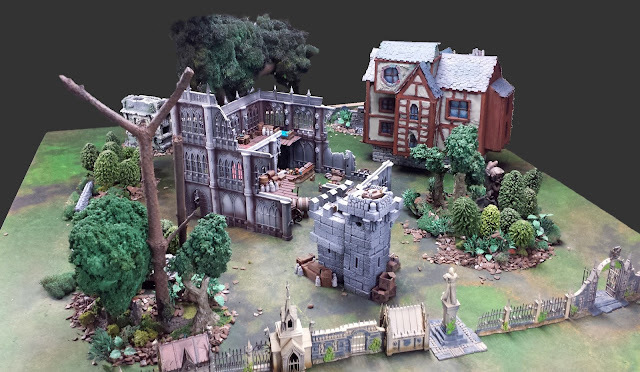 He scratch-built much of the terrain, including sprawling trees, plaster-cast towers and a vast mansion. Not only was it beautiful, but it was the best-lit wargaming space I've ever seen, which made photography a joy. My opponents were a well-supplied band of Marienburgers named "The Yuppies" who were led by Knock-Out Ned, a fashionable warrior armed with two dueling pistols. We randomly determined the scenario and came up with "Chance Encounter", meaning that the two warbands stumble upon each other while they are both trying to escape from Mordheim with a trove of wyrdstone. There's no turn limit, and each side is trying to bash the other into a rout. The Marienburgers set up first. Their vastly superior complement of missile troops (a hero with a bow and two henchmen with crossbows) occupied some ruined buildings with a wide field of fire. 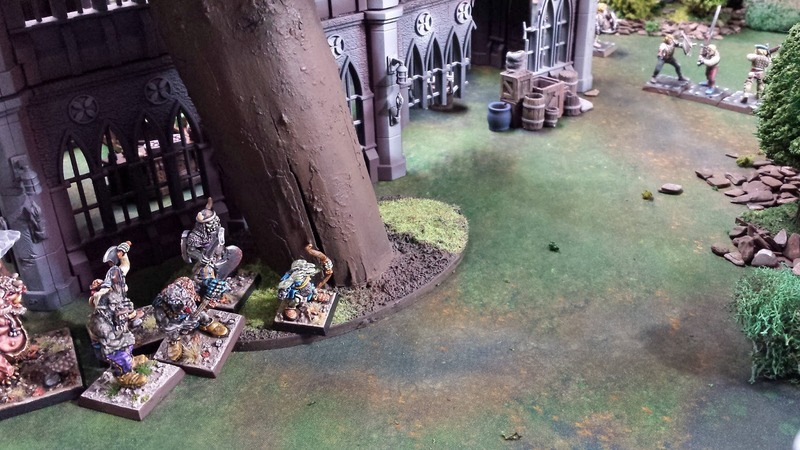 The rest of their forces fanned out, hoping to root out the orcs. For his part, Krapfang decided that cowering was the best strategy. There's no way he was going to walk out into the open ground and get shot to hell. So he and his cronies hid in a darkened corner of the ruins, hoping to gank the Marienburgers one by one. 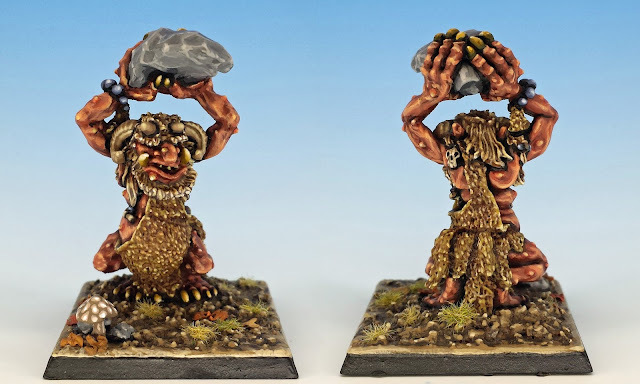 Sneaking up on people is not so easy when you have a drooling Troll in your midst, but Krapfang was finally able to creep up on the Marienburger's left flank. As Smarmy ineffectually shot his short bow, Krapfang shoved the Troll forward, hoping he would pass his stupidity roll and mount a charge. Things seemed to be looking up for Krapfang -- the Troll was shuffling forward, his shaman successfully cast "Ere we go", and the Marienburger crossbows had not found them. Hoping to overwhelm the enemy, he called for a general charge. And that's when things went to pot. Sludgewit the Troll failed his stupidity check and forgot to attack the enemy, even as Krapfang and his orcs had committed themselves to an assault. In the building above him, the crossbowmen began to rain down bolts. And the Marienburg leader, Knock-Out Ned, surged forward to help his men. The rest of the battle was one confused melee, as Knock-Out Ned sought to contain the orc charge with reinforcements and missile support. For his part, Krapfang was hoping to keep himself alive long enough for the Troll to wake up and save the day. And wake up he did! On the next turn, Sludgewit came to his senses and hurtled into the fray, facing Knock-Out Ned himself. 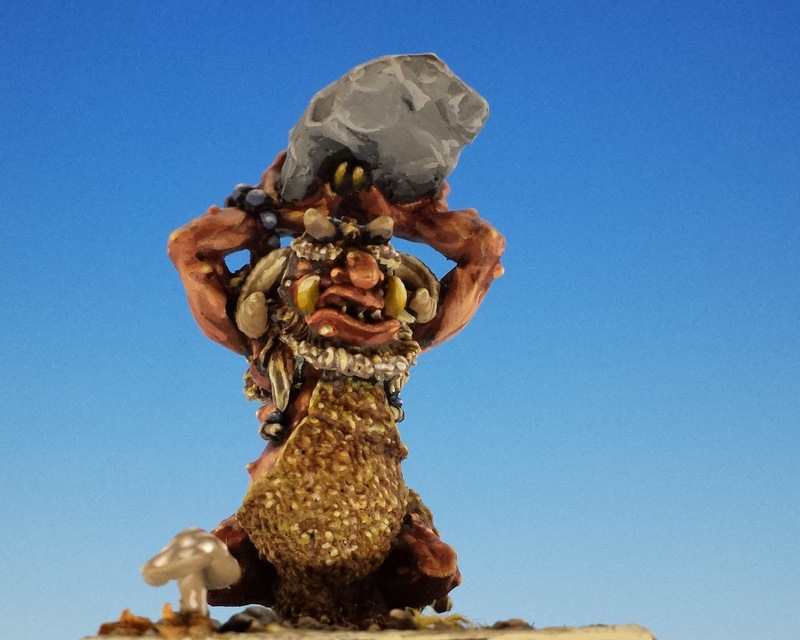 Krapfang had every reason for optimism, because Trolls have one nearly irresistible attack: they can regurgitate on their enemies. A Troll's gastric juices will melt a fully armoured man like a wax candle. In the coming turns, as the orcs were gradually beaten back, Sludgewit puked again and again on Knock-Out Ned. But the horrendous attacks only succeeded in stunning Ned, or I would roll a 1 on the injury rolls and not even achieve that. There was so much vomit. But all that vomit was for naught. Meanwhile, the Clarence Blackdung was felled by a crossobow, and then Krapfang himself was swept out of the game by two Swordsman. With Krapfang no longer there to prod him, Sludgewit had small hope of passing his stupidity checks, and would once again forget to fight. In order to save the rest of my warband (and the few pieces of Wyrdstone still in my possession) I voluntarily failed my rout roll and we ended the game. It was a splendid game: fast, eventful and filled with disgusting gastrointestinal drama. 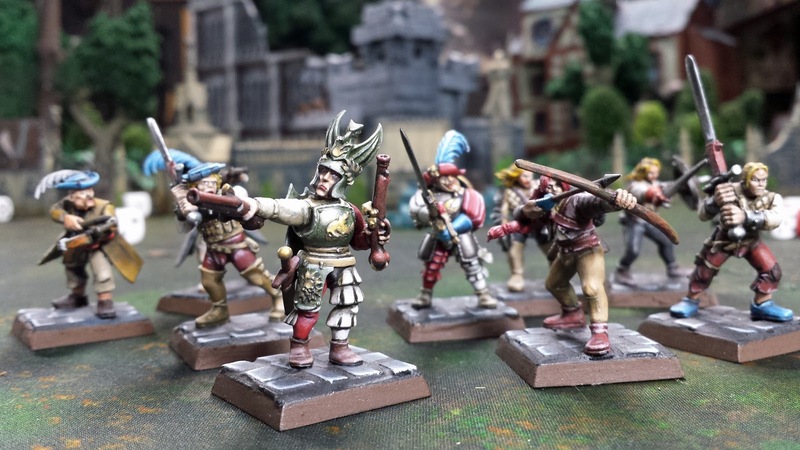 If you enjoyed Travis' video of the game, you should also check out some of his other work, such as his tutorial on building a Mordheim band or his other Mordheim battle reports. For my part, I am excited about finally getting into this game -- it's no doubt the best thing that Games Workshop came up with after about 1989. And although Krapfang was knocked out of the game, he was not killed, so I guarantee: he will be back, and he will be as big a coward as ever. Cool write up. Thanks for sharing. Fantastic! I wish I had the time to look at the videos right now but I'm under the gun to finish up a few projects. 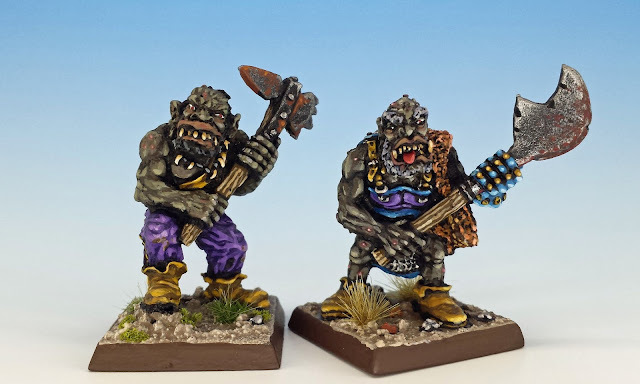 I can't remember if you are on the Oldhammer in the New World Facebook group, if you are could I reprint you blog post in the upcoming zine? The theme is going to be Mordheim, Necromunda and Mighty Empires. The only game I know anything about is Mighty Empires so I need some content. Yes please, Sean - go right ahead. 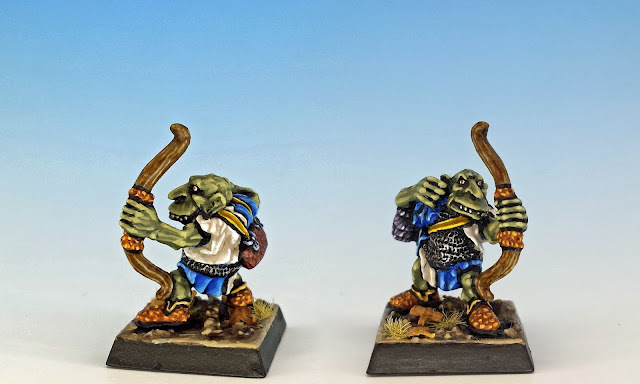 I'm not on Facebook yet, but I'm going to create a profile so that I can keep tabs on Oldhammer in the New World and some similar groups here in Toronto. And I'm looking forward to this zine... I love (LOVE) Mighty Empires. For my money Oldhammer is the only reason to be on facebook at this point. When you join the group you can download the first two issues from the file section. 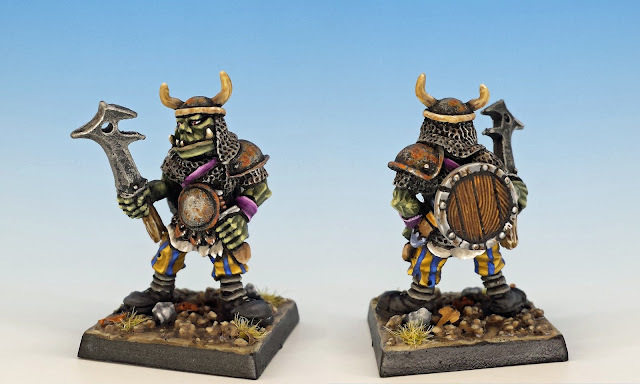 You should also see if you can work Oldhammer Weekend into your calendar October 20 - 22 near Newark, NJ. Mordheim is easily on my Mount Rushmore of 28mm games. An absolute classic which I still play to this day. You will love this adventure! I can see why you like it so much - it's fast, zany and easy, and with lots of flavour. Love the battle report, your style of writing combined with these beautiful pictures is a perfect example on how things should be done. Thank you so much, WW. There is something about writing up a good battle that is very satisfying. Your writing is the best man. It's the best! Love the additional plugs by the way; appreciate it. Long live Krapfang. I'm glad you think the write-up did justice to the game and your excellent scenery. Can't wait for our next match. I hope you give it a try - it is a lot of fun. My sweet Odin~! You're master! Oh, sweet!! Most enjoyable read. Shamefully I never got to play Mordheim back in the day, all I see of the game is so great! I'm happy you liked it, Suber. I'm loving your comic book. I should have painted some varicose veins on her. I really enjoyed the video and the game. 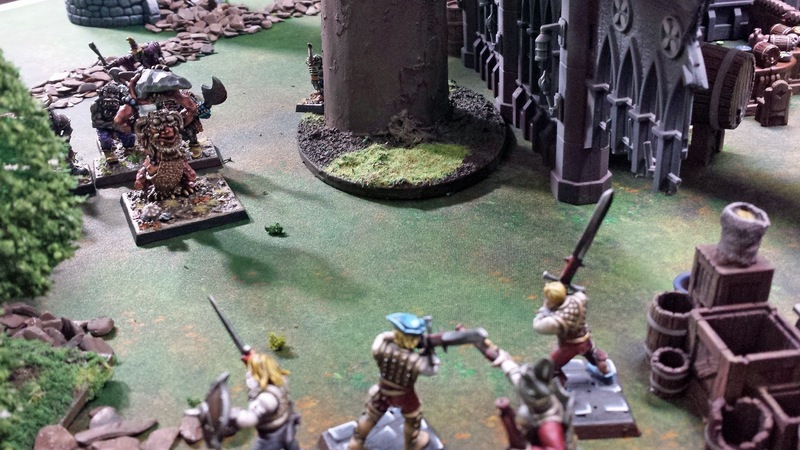 I play Frostgrave but fancy giving Mordheim a whirl. Do you think it would work solo? I think Mordheim would be a lot of fun solo. The game-play itself doesn't use hidden information, so solo fits well in that respect. And (like Frostgrave), the building of the warband (and especially the post-battle expansion of the warband) is the real fun. Fantastic game, photos, and write up! 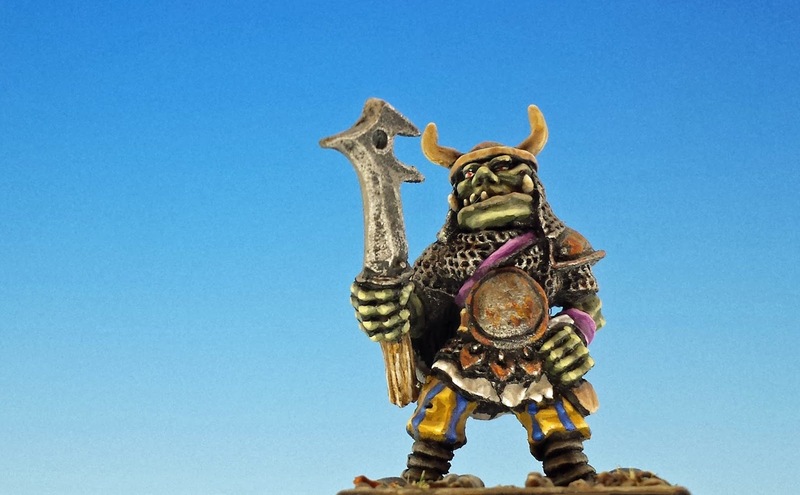 A wonderful rag-tag bunch of orcs and goblins (and troll) to make your warband. Your painting and little backstories add even further character; great post to read through, thanks! I am really happy you enjoyed the read - it was certainly fun to write. "Krapfang's "cunning plans" always revolve around finding a big, hungry monster and then hiding behind it until the enemy is safely ensconced in its digestive tract." I dunno... that sounds more solid than a lot of plans that aspire to being significantly more cunning :/ I think they'd have done a lot better if they'd been able/willing to afford a less moronic "tank" , but if your livelihood includes sneaking into a ruined city full of heavily-armed desperadoes to steal wyrdstone, your salary offer is probably only whatever coppers are stuffed in your codpiece. Anyway, a fun entertaining read as always! You've nicely isolated Krapfang's problem -- sort of like Groucho's "I wouldn't join any club that would have me as a member." Only a moron would want to join his warband. What a stonker that was. I'm going back through your WFB.3 reports now. Good times.